India’s 2nd Bullet Train coming soon? Ministry of Road Transport and Highways and Indian Railways are joining hands to introduce Bullet train and Expressway at the same time to Indian people soon. Mumbai and Nagpur, Ministry of Road Transport and Highways has already started work on developing an expressway, which will reduce the travel time between these two important cities. 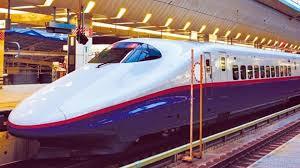 Indian Railways has proposed developing bullet train track either on the expressway, on adjacent to it. This would be first such coordinated move by Railways and Road Transport dept. One of the official said " It’s a new way of executing the project faster, as the combined efforts to acquire land will ease a major burden for both ministries and pave the way for speedy execution". Mumbai-Ahmedabad corridor, this shall be 2nd bullet train route in India. Spanish consultant Ineco was consulted regarding this and meeting has turned out to be positive as of the sources.